It is hard to avoid stories about the latest must-eat food to join the anticancer brigade. First it was select vegetables and berries, then red wine, dark chocolate and coffee. Newspapers frequently tell us that antioxidants ’fight (nasty) free radicals’, and the words ’polyphenol antioxidants’ have entered the mainstream. Swiss food giant Nestlé even sells a coffee called Nescafé Green, advertised as containing ’high levels of naturally occurring polyphenol antioxidants which can help protect the body’s cells from day to day damage’. 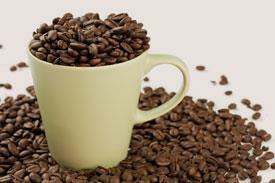 The coffee contains unroasted (green) coffee beans in a bid to boost antioxidant levels. Coffee is indeed one of the richest sources of phenolics in the western diet and can potentially pack a strong antioxidant punch, in theory protecting cells if the body’s natural mechanisms fail to keep levels of reactive oxygen species under control. Yet the story is far more complex than a simple battle between antioxidants and free radicals. All of the antioxidant-rich products, from red wine to coffee, have far subtler modes of action than previously thought, says Alan Crozier, a plant biochemist at the University of Glasgow, UK. Coffee has been suggested to help protect against gout (by lowering uric acid levels), tooth decay and gallstones. And so the list goes on. In particular, there is mounting and strong evidence for coffee providing some protection against type 2 diabetes. Coffee contains a tremendous number of chemicals, with over 1000 aroma compounds. If you are looking for antioxidants, the most abundant phenolic compounds in coffee are chlorogenic acids (CGAs), which account for up to 12 per cent of the dry weight of green unroasted coffee beans. Much of coffee’s bitter taste comes from CGAs, which also cause the acid reflux that is sometimes experienced by coffee drinkers. 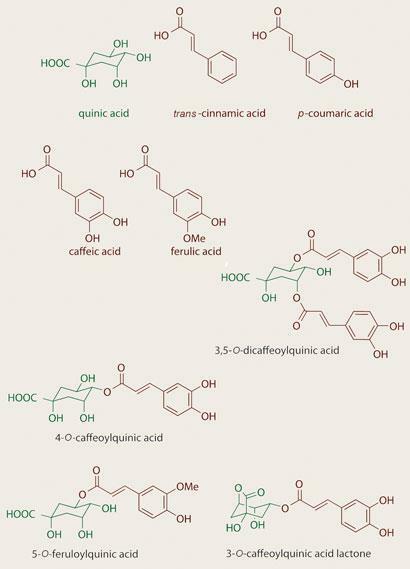 CGAs form in the coffee plant by esterification of trans-cinnamic acids (mainly caffeic, ferulic and p-coumaric acids) with hydroxyl groups on quinic acid. The resulting conjugated CGA structures are known as caffeoylquinic acids, feruloylquinic acids and p-coumaroylquinic acids respectively. Up to half of the CGAs in green coffee beans degrade during high-temperature roasting, which causes a host of chemical reactions. Some of the CGAs hydrolyse to form free phenolic acids or dehydrate to bitter-tasting chlorogenic acid lactones. Others are involved in Maillard browning reactions to give a wide range of compounds including brown coloured and very bitter-tasting antioxidant polymers called melanoidins. The concentration of CGAs in a cup of brewed coffee varies hugely, from about 20-675mg per cup - compared with 20-60mg in an average cup of tea. CGA levels not only depend on roasting time and temperature, but also on the coffee beans - Arabica beans have lower levels of CGAs than Robusta - and the brewing method. Decaffeinated coffee contains similar levels of phenolics to caffeinated coffee, and can contain higher levels, thanks to a concentration effect that occurs during decaffeination, says Yi-Fang Chu, who leads the coffee and wellness research group in the US at Kraft Foods Global. CGAs in coffee are absorbed in the small intestine to appear in the circulatory system mainly as glucuronidated (coupled with glucuronic acid, a common way the liver solubilises compounds to prepare them for excretion via the kidneys), sulfated and methylated metabolites, explains Crozier. ’It seems as if the compounds trigger events and depart. The body gets rid of them pretty quickly [in urine or bile],’ he says. Crozier’s team used liquid chromatography-mass spectrometry (LC-MS) to analyse urine samples from the ileostomists and from people with healthy colons. The ileostomists excreted only 8 per cent of their intake of CGAs in urine while healthy volunteers excreted 30 per cent. The CGA compounds absorbed in the colon ’must have been in the circulatory system in relatively high concentrations compared to the compounds that are absorbed in the small intestine,’ says Crozier. The ferulic and caffeic acids form phenolic acids such as dihydroferulic acid or dihydrocaffeic acid. 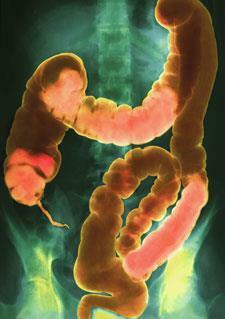 ’People are starting to get interested in the impact of these things on colonic health,’ says Crozier. There are some suggestions that the compounds could act as prebiotics, stimulating the gut bacteria. There is growing evidence that compounds broken down in the colon form a key part of the ’bioavailability equation’ of flavonoids and related compounds that not only occur in coffee, but also in vegetables and other beverages, says Crozier. What is more, the colon-derived phenolic acids appear to have in vitro anti-inflammatory activity, and to protect human nerve cells against oxidative damage, says Crozier. Some of the phenolic acids are also thought to be involved in helping to prevent regular coffee drinkers from developing type two diabetes. Chu has tested the ability of coffee to protect neurons, at least in vitro, and found that treatment with either green or roasted coffees protects cells against oxidative stress induced by hydrogen peroxide. The roasted coffee was far better at protecting cells than green coffee, perhaps because it has 30 times more lipophilic antioxidant activity. Chu’s team, which included researchers from National Yang-Ming University in Taiwan, suggests that lipophilic antioxidants such as chlorogenic acid lactones are key to coffee’s apparent neuroprotective effects, possibly because the brain is such a lipid-rich organ. Chu stresses that more work is now needed to identify ’key neuroprotective coffee bioactives’. Chu’s team has also studied coffee’s anti-inflammatory effect on cells in the lab. The main putative anti-inflammatory components are chlorogenic acids, he says. Yet in experiments with pure CGA, Chu was unable to achieve the same results as with coffee. ’The pure compound does not have the same level of inflammatory inhibition as whole coffee, so we propose that there is a matrix effect whereby components of coffee work together to provide benefits,’ says Chu. 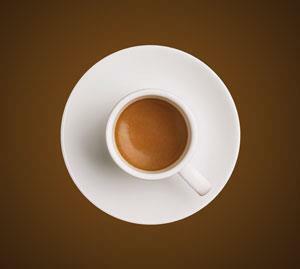 Caffeine is known to improve memory and the speed with which our brains process information. It binds to some of the same receptors as adenosine, a compound that promotes sleep, amongst other things. Caffeine is a non-selective antagonist at A1 and A2A adenosine receptors in the heart and the brain, having an opposite effect to adenosine and producing a stimulant effect. The Finnish study was by no means the only one to suggest that caffeine may help to stop a decline in brain activity with old age. In the Three City study, carried out in the French cities of Bordeaux, Dijon, and Montpellier between 1999 and 2001, over 9000 people aged over 65 were questioned about their levels of tea and coffee consumption and their mental agility assessed using standard tests. When a team of French researchers led by Karen Ritchie at Montpellier University analysed the data, it suggested that there was a ’significant relationship’ between higher caffeine intake in women without dementia and ’lower cognitive decline over time’. Curiously, no relationship was found between caffeine intake and cognitive decline in men.6 Not to worry - a team led by researchers at the National Institute for Public Health and the Environment in Bilthoven, the Netherlands, suggests that ’consuming coffee reduces cognitive decline in elderly men’ based on analysis of data from a 10-year study of men from Finland, Italy and the Netherlands. Of course, there are negatives. For example, coffee contains 4-methylimidazole, which the US National Toxicology Program (NTP) has identified as a carcinogen. The compound is used to manufacture many products, from dyes to agricultural chemicals and rubber. But it can also form through the Maillard reaction in foods and drinks, particularly those with a caramel flavour such as Cola.7 The levels of 4-methylimidazole in cola drinks are similar to those in coffees, says Takayuki Shibamoto, at the Department of Environmental Toxicology at the University of California, Davis, US. ’Understanding how the chemical forms in coffee and how to prevent it from forming is not easy,’ says Shibamoto. Nevertheless, he is committed to the task, largely because the compound is listed by the California Environmental Protection Agency as a ’Proposition 65 carcinogen’ in California, US. This means that food or drink products known to contain levels of the chemical exceeding the 16ug per day consumption limit must be labelled as such. The original NTP study suggested that 4-methylimidazole caused cancer in mice fed up to 1250ppm of the compound for two years, equivalent to up to 170mg/kg of body weight for the mice. A 60kg person drinking a whole 591ml (20 fl oz) bottle of cola would only ingest 3.3ug/kg of 4-methylimidazole, says Shibamoto, so coffee drinkers would be likely to have even less exposure. Then there’s the suspected carcinogen acrylamide (2-propenamide), which is highly water-soluble and also thought to come from the Maillard reaction. Last March the European Chemical Agency added acrylamide to its ’list of substances of very high concern’. Acrylamide formation peaks at some point in the roasting process before decreasing significantly. The degree of roasting is therefore a key factor in determining acrylamide content, says Rita Alves, from the University of Porto in Portugal. Alves and her team have analysed acrylamide levels in espresso coffee and shown that light roasts contain significantly more acrylamide than dark ones. Bean type also appears to affect acrylamide levels and Robusta espressos contain almost twice as much acrylamide as their Arabica counterparts, says Alves. She estimates that what she calls a ’moderate’ espresso consumer who drinks 3-5 cups per day will probably ingest about 4-6ug of acrylamide per day. Alves admits that it is nigh on impossible to cut acrylamide levels in coffee without affecting quality, but suggests opting for higher levels of Arabica beans and a darker roast. A short espresso rather than a ’lungo’, which takes twice as long to prepare, may also have a lower level of acrylamide because the chemical has less opportunity to transfer to the drink, she says. So many chemicals to think about. If you already enjoy drinking coffee, it is nice to think that you might be doing yourself some good. Do you take milk? Or sugar? If so, you may be changing the antioxidant chemistry. Crozier has already shown that adding cream to strawberries slows absorption of antioxidants and studying the effects of additives on the bioavailability of coffee’s antioxidants is next on the agenda for many coffee chemists. Whatever the science may be, coffee certainly gets the brain into gear in the morning and gives much pleasure. Just remember the key word that is never far from a nutritionist’s lips when it comes to red wine and coffee: moderation.